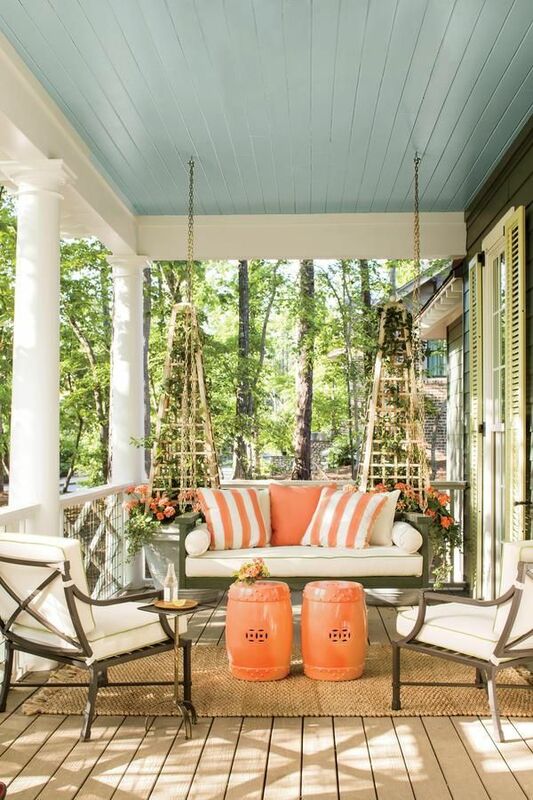 If you are a native of the south, perhaps you know the origin of the distinctive blue-gray shade painted on the ceiling of many southern front porches. Actually, this centuries old Southern tradition has made its way north lately, and “haint blue” can be found as a ceiling shade all across the country. But many of us, even some who have included this trend in our exterior decorating, do not actually know the origins of the haint blue tradition. What Exactly is Haint Blue? There actually isn’t just one color that we are referring to when we say “haint blue.” There are numerous shades in the green-blue-gray color family that one could use to achieve this look, including periwinkle, aqua, cobalt and robins egg blue. Whatever the name says on the paint can, the color should be pale, powdery, and remind you of a cloudless sky. After all, what makes the color haint blue isn’t the color itself, but rather how it is used. Many people paint their ceilings one of these shades simply because it is what their parents and grandparents did. They continue the tradition often without realizing why. According to Southern, and even more specifically Gullah folklore, “haints” are any variety of unwanted specters, phantoms, spooks, and apparitions. Haint blue, which can also be found on door and window frames in addition to porch ceilings, is said to protect the house and it’s occupants from these haints. The color fools them into thinking that the door is part of the sky, or that the porch is surrounded by water, which is important because superstition also holds that a spirit cannot cross running water. A more practical reason to try this color trend is because sky blue paint might actually fool insects as well. Many people believe that a porch painted a soft blue will trick wasps and other insects into thinking it’s the sky, causing them to build their nests elsewhere. It could also cut down on the number of spiders spinning their webs in your porch corners for this same reason. So, whether the choice is based on superstition, getting rid of some of the peskier parts of nature, or just because you think it’s a lovely color, blue porch ceilings are a wonderful way to add visual interest to your outdoor space.